On Feb. 13, 25-year-old ace Aaron Nola agreed to a four-year contract extension with the Phillies. A day later, 26-year-old Max Kepler and 25-year-old Jorge Polanco agreed to five-year extensions with the Twins. The following day, Yankees ace Luis Severino, who turned 25 a few days later, signed a pact with the Yankees. The deals marked the beginning of a historic spree of extensions. 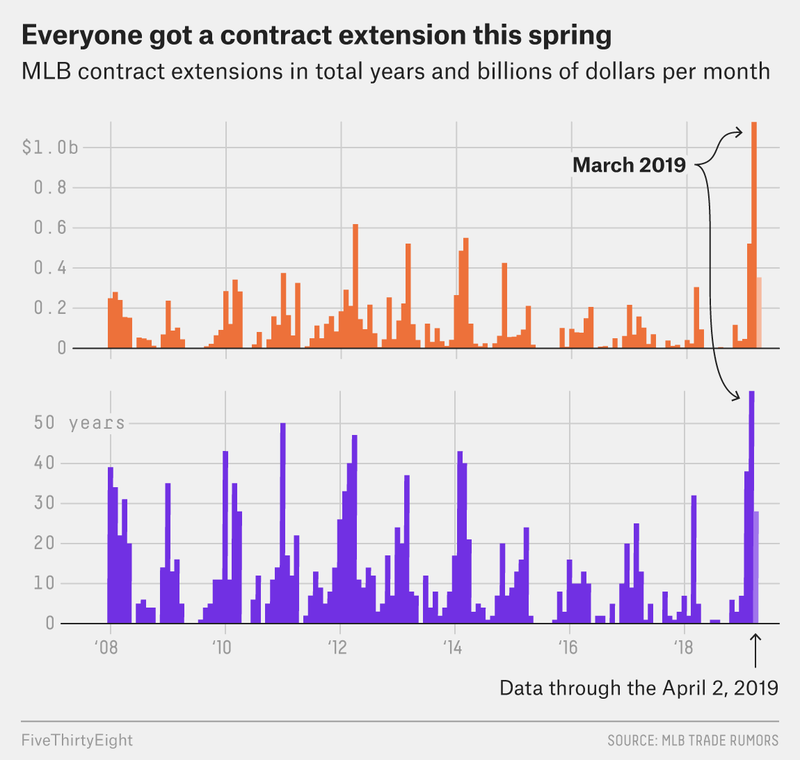 From mid-February through Thursday, 27 players had agreed to extensions worth a total of 132 years and $2.045 billion, according to data from the MLBTradeRumors.com extension database analyzed by FiveThirtyEight. There has never been a flurry of activity like this: March represented the most dollars ($1.126 billion) and years (58) awarded in contract extensions in a one-month period that we’ve seen. While veteran stars including Nolan Arenado, Chris Sale and Mike Trout all signed massive extensions this spring, players with little major league experience made up the majority of the deals. Fourteen of the players — including reigning NL Rookie of the Year Ronald Acuna, who signed a $100 million extension last week, and fellow Brave Ozzie Albies, who signed a much-discussed extension Thursday — were so early in their careers that they were not yet eligible for salary arbitration, which generally requires a player to accrue three years of major league experience before becoming eligible to negotiate for significant raises. Eight others were at least a year shy of six years of service time, the amount required to become a free agent. In 2019 to date, players signing extensions have forfeited 51 combined arbitration-eligible seasons and 69 future free-agent years. The deals also include club options covering 25 seasons. Buying out the arbitration and free agency years of younger stars for the purpose of controlling and reducing payroll costs was a practice pioneered in the early 1990s by John Hart, then general manager of the Cleveland Indians, who watched great Pittsburgh Pirates teams broken up prematurely because of escalating player costs. While extensions had since become common practice, the activity had slowed in recent seasons as young stars like Bryce Harper and Manny Machado seemed intent on hitting the open market as soon as possible. So what’s behind the extension surge this spring? Why are MLB teams intent on avoiding arbitration and locking up young stars? It may be because arbitration wasn’t working to begin with — at least from the perspective of the teams. Under arbitration, a player and a team each puts forth a salary amount to a panel of arbitrators, who then must decide on one of the two figures. In the past two offseasons, players have totaled more wins than losses in arbitration cases against the owners — the first time that’s happened in back-to-back years since 1989-90. Through 2015, owners had won 58 percent of all arbitration cases, according to Forbes. This winter, Gerrit Cole ($13.5 million) and Trevor Bauer ($13 million) were among the six players to win their cases against their clubs. Arenado and the Rockies avoided a hearing, which is common practice, by signing a one-year, $26 million deal — a record for a player eligible for arbitration. “We’re going to be seeing $20 [million] and $30 million salaries regularly in arbitration,” one agent told us. “They [MLB teams] are going to try and push back on that. How do you do it? You pull those guys out of the system. The agent noted that teams look at arbitration as an important battleground and have scores of analysts that compile data for these cases. By taking players out of the arbitration system, the teams not only cap earning potential for those players, but they also reduce salary comps for other players. Agent Scott Boras described the MLB’s aggressive approach with young players and extensions this spring as “snuff contracts” — or an attempt to snuff out future markets. Greg Dreyfuss, an associate general counsel for the union and the MLBPA’s director of analytics and baseball operations, also sees a link between the wave of extensions and players’ recent arbitration wins. The union and players have closed the data gap between clubs in making their cases. Dreyfuss says agents and players are educated on the market. While MLB payrolls remain stagnant, the records for largest arbitration salaries have been set in the past two years. The average salary of an arbitration-eligible player in 2011 was $2.73 million; that increased to $3.97 million this year, a 45 percent jump, according to analysis of MLBTradeRumors.com data. The total dollars and players in the arbitration system has jumped from $393.6 million and 144 players in 2011 to $789.6 million spread among 199 players this last offseason, growth in part due to the game trending younger — meaning that there will be more 20-somethings entering arbitration. While spending efficiently is always a goal for teams, how these clubs have handled free agency in recent winters may be a motivating factor in some players’ decision-making. Even Trout, the game’s best player, expressed reservations about entering the open market when he signed a record extension (which is also a bargain for the Angels) this spring. Not all extensions are club-friendly. Drefyuss notes that there have also been a number of veteran players who have agreed to extensions that will pay them lucratively into their mid-30s. One key decision a player must make when considering an extension is how much financial upside to concede for the sake of job and financial security. In dealing with future risk, teams face less downside than individual players do. While a team can absorb a poor contract, a player is one injury or decline in performance away from having his career trajectory significantly altered. Acuna and Albies look like future superstars, yet they signed deals that could potentially cost them nine figures in future earnings. White Sox top prospect Eloy Jimenez signed a six-year deal with two club options before he ever took a major league at-bat, limiting his financial upside. Those are the types of club-friendly deals that some on the players’ side have criticized. There is also an argument that individual players ought to consider not just themselves but their peers and future major leaguers when considering a long-term deal — and that they should wait until they are at least arbitration-eligible. Toronto outfielder Randal Grichuk, 27, said the Blue Jays began negotiating with him last month during spring training in the midst of the extension spree. He eventually signed a five-year, $52 million extension. Grichuk was into his arbitration years when he signed his extension, but he didn’t take issue with young stars like Acuna opting for financial security earlier along in the process.